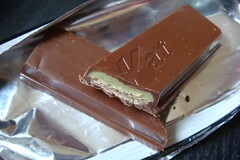 Over the years, Nestle has put out a couple different matcha KitKats in Japan. I had one over a year ago that was matcha and white chocolate swirled on the outside and was not only delicious but very pretty, but it's been too long for me to really review that one accurately. So here is a newer (though not really new) matcha KitKat I got recently. You can see on the box that this one had a milk chocolate coating, two wheat wafers, and a matcha cream filling in the middle. What you can't really see is that instead of the usual twin bar that you break apart, these were individually wrapped, wider KitKat bars (more room for filling, I guess). I was somewhat pleased with this. 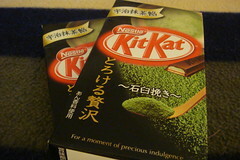 The chocolate coating was thick and had a good texture, and the matcha cream was soft and smooth, but rather tasteless. I couldn't pick up a matcha taste at all, actually. My husband thought these were barely KitKats because of the reduction in wafers, but we both agreed that they were tasty. Not as good as the Caramel KitKats, but that's another review.